A soldier from Santa Maria was one of two men killed Friday during a bombing in Afghanistan, the Department of Defense announced. Spc. Kenneth Clifford Alvarez, 23, of Santa Maria and Pvt. Jonathon Michael Dean Hostetter, 20, of Humphreys, Mo. died in Haft Asiab, Afghanistan from wounds suffered when enemy forces attacked their unit with an improvised explosive device during combat operations. Both soldiers were assigned to the 2nd Engineer Battalion, 36th Engineer Brigade based at the White Sands Missile Range in New Mexico. 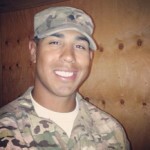 Rest in Peace, SPC Alvarez. The engineers have a very tough job: route clearance. Basically, they get paid to get blown up. I’ve seen the yards full of broken and blasted MRAPs and Huskys in Afghanistan. Whatever one’s personal political beliefs may be, please pray for this Warrior and his family. electing a new group of Bozos to “handle” things in Washington WILL NO LONGER AVAIL. So when we attack Syria, you’ll be ready to march on D.C., I take it? The middle east is ON FIRE and our president and executive branch are making even W look effective (and that’s pretty hard)… and we fell for him TWICE. Do we now understand he’s an empty suit, with so little experience, knowledge, or guts that every day we continue with what we have, more and more will be thrown to the meat grinder. And for what? Benghazi and Libya should have clued us in, but as that dreg Hillary said, “what difference at this point does it make?” Egypt is in a civil war from a failing coup, and Iran is waiting for us to attack Syria and (yet again) support the Muslim Brotherhood. MB is everywhere, and I fully believe has it’s players in the executive branch directing our Empty Chair in Chief. How’s that hope and change working out for us? Want to learn more about the Muslim Brotherhood? (which is why we’re NOT out of the Middle East, and losing our young men and women to these ridiculous “wars”). I warn you, this is not for public consumption in this day. A lot of “deprogramming” had to be done since some of this info broke in the early 80’s. Sorry for this. X five in the 60’s/70’s, rOy. Didn’t do any good then; sure as hell won’t do any good now unless you are a Big Bucks lobby for your company/special interest in which case you’d be taking the Gulf Stream; not marching. This is no longer a “country of the people..” Please don’t be so naive as to believe that your/my “elected” officials give any sized rat’s A-S you select about what you or I want/ need/suggest, ad nauseum. Have I *ever* given the impression our elected officials give any sized rat’s a$$ about us? I think you have me quite confused with someone entirely different. FYI: read that link on Muslim Brotherhood that I have in my reply above. the war machine is served by Obama just as it was by Bush the only difference is the mask of regret Barack wears as opposed to the smoke em out cowboy costume used by W .
I hear ya SLOTECH, truly a tragedy for the family and our Country. And now the family gets to pay $4.00 plus a gallon for the gas to attend their dear son’s funeral… when will it all end? My prayers for the family. I for one would be interested in donating what little I can to the family. Please CCN, let the readers know if a fund is set up for the family of this fine young man. Yes, what a handsome young man with a great smile. Condolences to the Alvarez family. Thank you for your son’s service.